You gotta love food stories that start with a romance…they practically write themselves. Like when I was interviewing Ethan Bisagna for a story on great farmers' market meals and he mentioned that when he was a butcher at Clyde Common he met a kindred spirit in sous-chef Ashley Brown. I had to restrain myself from shouting, "Gold!" He loved her passion for the foods of Spain and its Basque culture, developed over years of travel, cooking and eating there. Their mutual love of good food got them talking about building a business, which led to building a life together. 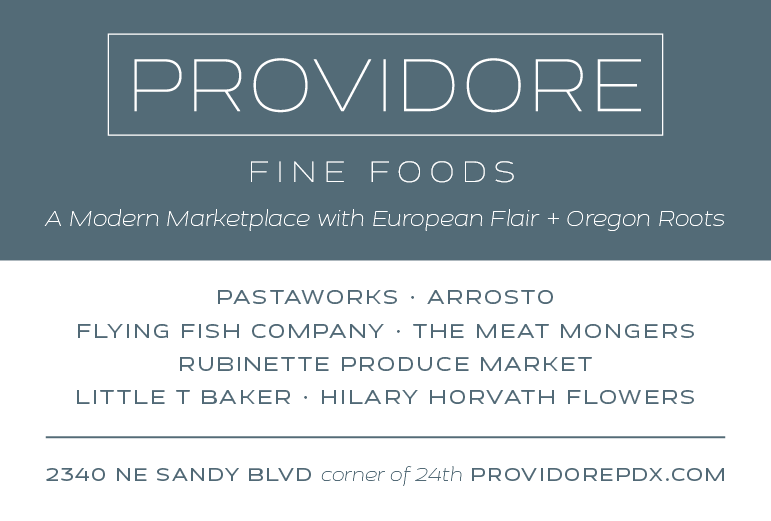 Ethan recently left his post as head butcher at Laurelhurst Market to launch Feastworks with Ashley, selling their sausages and charcuterie at the Beaverton, Northwest Portland and Woodstock farmers markets. 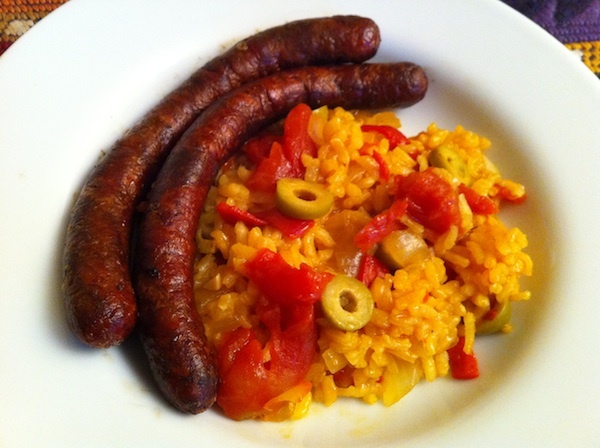 One of the sausages they make is chistorra, a long, thin, richly spiced sausage packed with the flavors of her favorite region. I bought a few at a recent stop at Feastworks' Beaverton market stand and brought them home to throw on the grill for dinner. The question was, what to have with it that would complement but not compete with its lovely spiciness? I was pondering making a rice dish, and when I mentioned it to Dave he said, "Oh, like paella?" and a brand new favorite was born. The grilled sausages alongside were fantastic, but you could just as easily treat them like traditional Spanish chorizo, cutting them into 1" chunks and throwing them into the pan before you sauté the onions and garlic. Put saffron and salt into mortar and grind until saffron is crushed. Set aside. Heat oil in skillet and add onion and garlic. Sauté over medium heat till translucent. Add rice and stir for about a minute, then stir in pimenton and saffron salt. Add wine and stir until liquid is absorbed, then add stock, tomatoes, piquillo peppers and bay leaf. Bring to a strong simmer, then reduce heat to low and cook until rice is done. If it gets too dry, add liquid but don't stir; a little browned crust, called socarrat, on the bottom is a good thing. Adjust salt and serve. * Basque version of "bon appétit." This was seriously good…we had it for lunch a couple of days later and, if anything, it was even bettah!